Fake Meat: the Future of Food? Several restaurants, including White Castle, now proudly serve the “Impossible Burger,” a plant-based product so real it “bleeds.” KFC is considering a chicken-free chicken. And Beyond Meat—maker of the eerily beef-like “Beast Burger”—had to build a second production facility this year due to overwhelming consumer demand. From mock sausage to phony bologna, food manufacturers have churned out an endless variety of animal-free versions of our favorite animal-based foods. But the techniques to mimic taste and texture have recently reached a whole new level. What makes Memphis Meats different from previous imitations is that it’s not made from plants. It comes from a new breed of imposter called “cultured meat.” The process involves growing a mass of animal stem cells in a petri dish to artificially produce the same tissue that naturally grows on a living creature. Of course, there are still a few kinks to work out. One of the major hurdles cultured meat faces is affordability. The first burger made from this method in 2013 cost $325,000 to produce. Scientists have since managed to whittle that number down, but a reasonable price tag is still in the works. Another problem with the cultured meat promise is that it’s not yet vegan. In order to get that hunk of stem cells to grow, you have to feed it. For cultured beef, that means bovine growth serum—an extremely expensive substance made from cows’ blood. To truly sell cultured beef as a compassionate alternative, manufacturers need a much cheaper nutrient formula that requires no animal input. But it can be done. JUST, a food company working on a cultured chicken, recently announced that they have a plant-based growth medium. JUST’s product is ready for release, but they are now up against a lack of regulatory clarity with selling in vitro meat. But even if manufacturers can work out these technical hurdles, they still face a problem of perception. According to Adrienne Rose Bitar, postdoctoral associate in History at Cornell University and author of “Diet and Disease of Civilization,” a big part of the ick factor we get when considering cultured meat is that it inhabits the same creepy gray area which fuels our fears of zombies. Bitar is currently researching the history of fake meat for a new project. She believes the big challenge of marketing cultured meat is striking the right chord with the consumer. The aim is to present a benevolent food of the future, without making people think they will be feeding on a scientific experiment. Despite all the hurdles that still need to be cleared to bring cultured meat to a market near you, it’s our evolving food attitudes that still make it a compelling venture. Growing concerns about animal welfare, environmental devastation, and the antibiotic-resistant superbugs associated with modern livestock production are prompting people to retreat from meat, or at least cut back on their consumption. Although it may share similarities to real meat on a cellular level, critics accuse cultured meat of being unnatural. However, if you consider how most meat is currently raised, natural is a term that has lost its meaning. Anybody who hunts or raises livestock knows that to make meat, death is part of the deal. Yet our love for meat makes this a price worth paying. Few people get excited about broccoli the way so many do about bacon. Fake meat is about having your cake and eating it too. The goal is to create a meat-like experience with none of the blood on your hands. The earliest meat analogues come from the Buddhist monasteries of ancient China, where things like tofu and seitan were born. There was no rule about being a vegetarian in original Buddhism, where the first practitioners had to beg for their food and ate whatever they were given. But as the religion spread to China, monks began distancing themselves from meat, particularly after Emperor Wudi became a vegetarian to demonstrate his compassion. Ancient monks ate very simply by themselves, but things got fancy when they had to feed the meat-eating pilgrims who came to their temples. To give visitors a taste of the familiar, while still adhering to their vegetarian precepts, monks recreated classic Chinese dishes with the first plant-based substitutes. Some of us may remember an interest in fake meats coming out in the Asian-influenced macrobiotic movement 50 years ago. However, Bitar discovered that the first American examples emerged not in the 1970s, but in the early 1900s. It started with John Harvey Kellogg, who famously preached vegetarianism as a means toward a more pure, healthy, and spiritual existence. Kellogg is best known for inspiring the breakfast cereal industry, but his influence also set off a lesser known fake meat industry. The products of his time were made from a combination of ground peanuts and wheat gluten, packaged in cans, and ordered through the mail. Health is one reason people are backing away from real meat today. The are concerned about saturated fat and the mounting science that links cancer with eating animal flesh. However, fake meat may not be the path to health either. 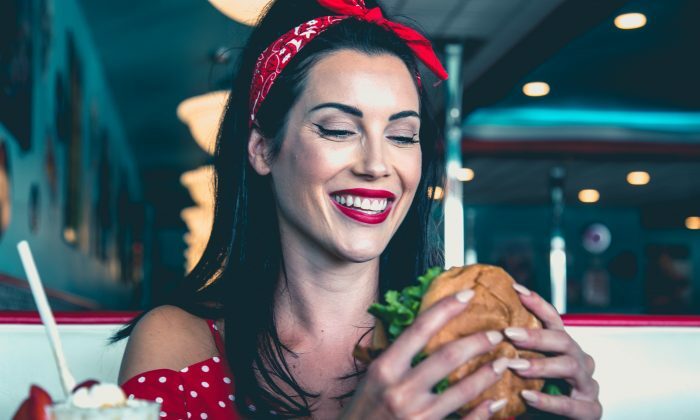 Jennifer Mimkha, a registered dietitian with Prana Nutrition in Florida, preaches a plant-based diet, but she sees meat imitations such as Tofurky and soy dogs more as vegan junk food than real nutrition. Making plants taste and chew like flesh means that meat substitutes are often highly processed and contain fillers we probably don’t want to consume too often. Plus, many of these products are made primarily with soy and wheat—two ingredients that a growing number people are trying to avoid. But fake meat manufacturers are getting wise to consumer interest in healthier substitutes. Part of popularity of the Beast Burger is due to its nutritional profile. It contains no soy or wheat, yet still boasts 20 grams of protein. It also has more than double the amount of iron and almost half the saturated fat found in an 80-percent-lean beef burger. Mimkha appreciates that there are more meatless options than ever, but she encourages her clients toward homemade burgers rather than store bought. While they may not taste much like meat, they can still be satisfying. As for cultured meat, Mimkha supports any move toward eating fewer animals. But she’s not interested in trying it herself. An accurate meat replica is not an experience she seeks. Bitar, however, is looking forward to her first bite.